Solid and durable, that is the claim of Flexz Fitness. The Flexz Fitness Belt with lever buckle is an innovative design, but I have yet to see a weight lifting lever belt other than the one from Inzer that inspires confidence. This belt promises to support your back and stay strong through power lifts, helping reduce stress on the back and building better posture. It is also meant to help with squats preventing hyperextension. The belt is 10mm thick, so it is IPF and USAPL compliant. One standout feature is that this belt does not carry any emblem or insignia, so it looks professional. As for construction, it is made from high quality material though it isn’t genuine leather. The company does not send out any information regarding this either. However, it feels robust and capable enough. Flexz Fitness belts come in a total of six sizes. The size variations are lenient, and you should find one that fits you well with some room for growth. The Flexz Fitness belt might come in several sizes, but the length of the belt is actually longer than you would imagine. My small belt has a tail that almost circles around to the back! To me, this is a problem as it tends to come in the way of my workouts. I can’t do anything about that because it isn’t my belt. I am borrowing the Flexz Fitness belt from a work acquaintance who recently purchased it. I am pretty sure, it is going to be long even for her. Basically, you will have to cut off 3 to 4 inches from the end for a perfect fit. The belt is thick, and it feels rigid enough though the material is not leather. It is suede stitched over some kind of material that has a similar rigidity of leather. One useful aspect of such a construction is that the belt is comfortable to wear, even against bare skin. The lever is chrome finished though my experience with such belts is that the lever is the first thing to give out under duress. If only Flexz Fitness were transparent with the material used I could have been more confident of how it will handle power lifts. As it stands, I advise not doing more than 320 lbs with this belt. The design is similar to Inzer Lever Forever belt, but it costs at least 40 bucks less. The cost is probably the only place where the Flexz Fitness belt scores higher than the Inzer because in every other aspect this belt is inferior. Only time will tell if the belt is just as reliable as an Inzer product. Coming back to the lever, it looks great and almost fools you into thinking it is metal. However, the finishing is chrome, but underneath I get the feeling it is some cheap metal or plastic hybrid. The lever does not feel designed to last, and at best it will prevent rust from building up. Unfortunately, I saw some rust build up on the bolts when they arrived, and that is alarming considering the money you spend for this non-leather weight lifting belt. Likewise, the threads are a disaster. You can literally pull out the threads if you wanted to. With wear and tear, I do not think the threads will last and if they don’t have then the belt can give way in the middle of a dangerous deadlift! I am sorry, but I just cannot suggest buying the Flex Fitness Lever Buckle belt to an intermediate or professional weight lifter and fitness enthusiast. For beginners, this is a flashy Inzer substitute but nothing else. Good high quality looks with superior finishing. Available in plenty of different sizes. A good substitute for an Inzer belt only if you do not power lift. Poor quality check. The threads and bolts had some rust on them. The unknown material does not inspire confidence as you cannot make a judgement on its quality or rigidity. The lever mechanism is the weakest link in this belt. 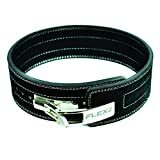 Personally, I will never buy or recommend the Flexz Fitness belt because of the number of unknowns and its high cost. At around $50 you can get an amazing traditional leather weight lifting belt and know it will easily handle 320 additional pounds of weight in deadlifts and snatches. If you are starting out lifting heavier weights and want something similar to the Inzer product, then this is an excellent alternative though severely lacking in the quality control department. Naturally, if you are someone who needs a solid leather belt, this is an absolute disaster.